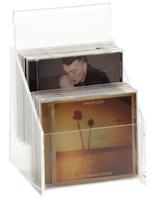 1 pocket holds up to 5 CDs. 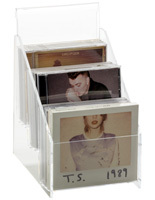 Built-in sign holder draws attention to your displayed products. 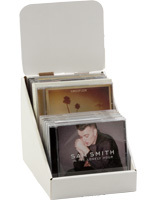 Small size is perfect for cash wrap areas! 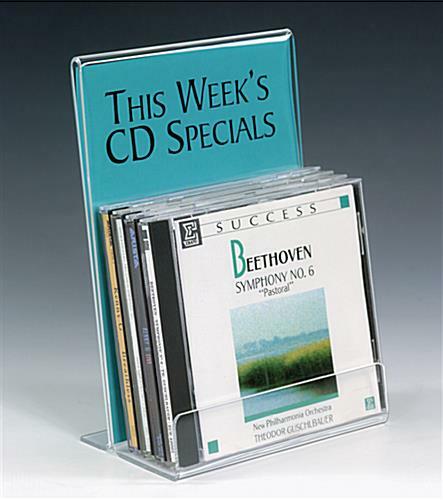 CD Racks - This acrylic CD rack holds up to 5 CD's. 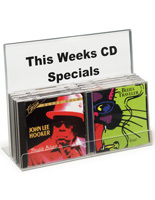 It has a 5" x 7" graphic area background, with an unobstructed view of 2.25" high x 5" wide, simply print your message on a 5" x 7" sheet of paper and slide it into the display. 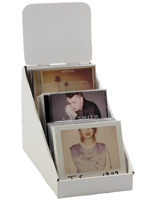 The sign holder makes a complete return, so the full 5" x 7" sheet of paper is trapped. You can customize you own messages with your word processing software. 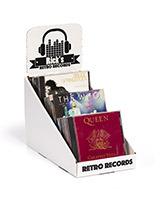 This display is great for retail environments, and will help get those last minute impulse buys or for giving away promotional cd's. Thanks for the great review and awesome shot of the product in action, Arthur! We're so happy you're pleased! 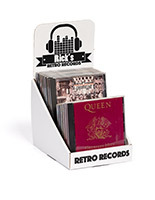 Great product....received on time....safely packed...and as advertised!